John Gregory Crace worked extensively for the 6th Duke of Devonshire at Devonshire House, London, and Chatsworth, designing a wide range of decorative schemes and furniture. He is also well known for his collaboration with A.W.N. 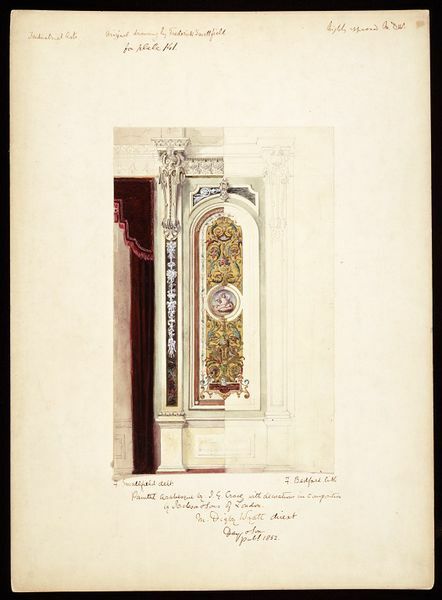 Pugin, with whom he worked on the decoration of the new Palace of Westminster, and the medieval court at the Crystal Palace. The Crace family were the most important firm of interior decorators working in the 19th century. They worked for every British monarch from George III to Queen Victoria and on a range of buildings that includes royal palaces, Leeds Town Hall and the Great Exhibition building of 1862. 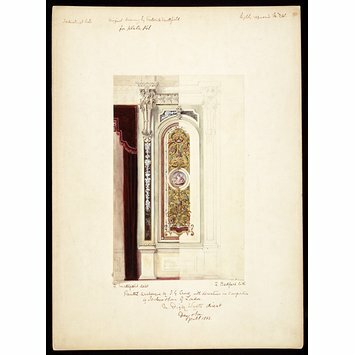 Drawing of a painted arabesque wall-decoration with composition ornaments. Inscribed with note, caption etc by M.D. Wyatt. Sir Matthew Digby Wyatt, The Industrial Arts of the Nineteenth Century at the Great Exhibition MDCCCLI, Day & Son, London, 1851-1853. Megan Aldrich, The Craces: royal decorators 1768-1899, London, Murray, 1990.